with Mayor Gallery, London, 1963. London, Artists' International Association Gallery, Fitzroy Street Retrospective. Soho Painters 1910-1920, July 1955, no. 31. At the Artists' International Association exhibition the present work was lent by Margery Fry, sister of Roger Fry. She may have acquired the painting herself (she owned several works by artists of the Omega Workshops circle) or it may have come to her through her brother's estate. 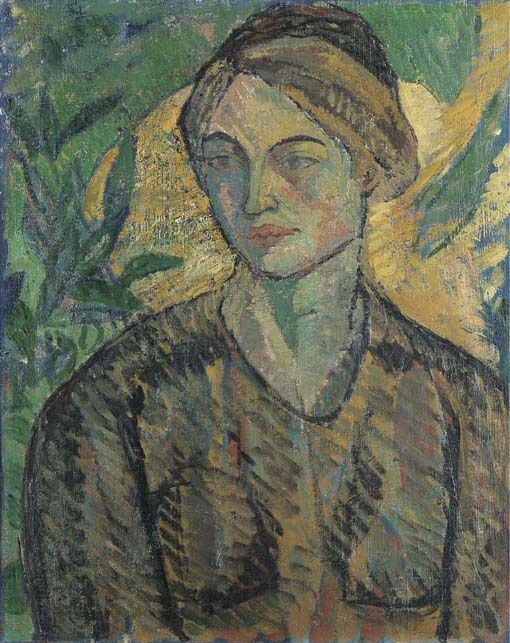 Etchells and Duncan Grant worked closely together in 1911-13 and Etchells's naturally linear, graphic style has been inflected here with the parallel brushstrokes common to several of Grant's paintings of 1911-12, such as Pamela, 1911 (Yale Center for British Art, New Haven). The model has not been identified; it is not Etchells's sister Jessie, a painter and contributor to the Omega Workshops (brother and sister appear in Vanessa Bell's Frederick and Jessie Etchells Painting, 1912, Tate Britain). Paintings by Etchells are comparatively rare; after a brief Vorticist period in the First World War, he became an architect for the rest of his life.